Gilded Birds: Tell me about your rubble. Gerald Barry: Some years ago I was shown around Handel’s house in London as a special favour. The house was not yet open to the public and was in the process of being restored. Holes had been made in many of the walls – for structural reasons I presumed. A woman took me around and in one of the rooms said, “In this room Handel wrote the Messiah.” I was very struck by this and knew I had to have something from the room. I said “What’s that over there” and when she turned to look I put my hand into a hole in the wall and extracted rubble, which I pocketed. I was very excited knowing that this rubble was probably a few feet from Handel as he was writing ‘How beautiful are the feet’. The rubble was saturated with those sounds. Later in Dublin, my neighbour and his son came round to watch a film on my television set. I wasn’t there. The rubble was on a plate on top of the television, and not realising what it was, they stubbed out their joints on it and threw it in the rubbish bin. When I came home I was horrified. The Messiah Rubble had fallen on a rotting chicken carcass but I managed to rescue most of it. 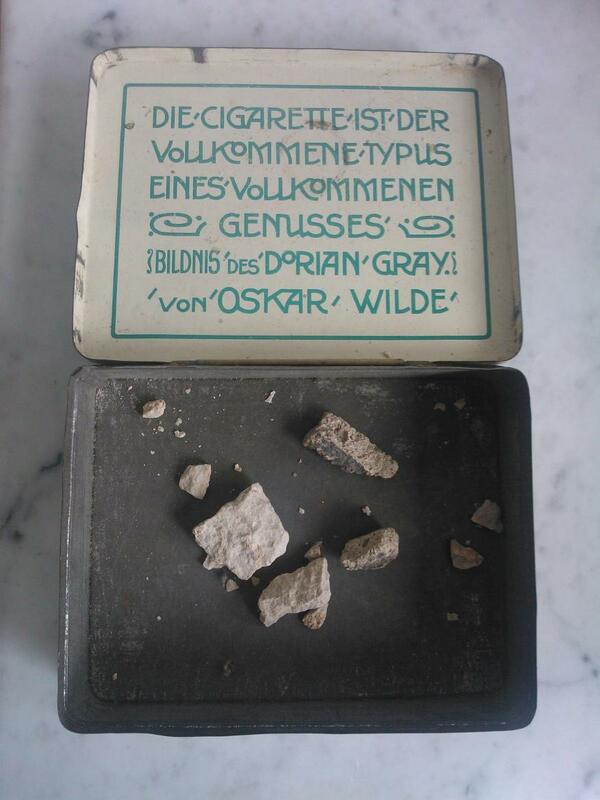 I now keep it in my Dorian Gray cigarette tin. Gilded Birds: What makes something worthy of the word Beauty to you? Gerald Barry: Anything that moves me. But I’m easily moved. In fact I feel everything too much. It’s sometimes a curse. It would be nice to retreat, which is why I love sleeping. Though I have very vivid cinematic dreams and often wake up exhausted. I’m like one of those neurasthenics in Henry James, though I detest Henry James. Gilded Birds: Do you see beauty in any art forms today? Gerald Barry: Beauty doesn’t change – it’s like rain, or vomiting. Everything remains the same. There’s no difference between Mantegna and Schubert – they are both operating at the highest level and dealing with the same intensities. They are messengers always coming to us with fresh news, unlike Henry James, whose works are unhealthy and full of nasty people. Gilded Birds: Is it relevant as a value in contemporary music or are there more important/different considerations now? Gerald Barry: To move is everything – nothing else matters. Unlike Henry James.